I often recommend multivitamins to clients in my private practice. While I always promote a well balanced diet as a primary form of nutrition, there are many reasons why people need supplements for optimal health. However, not all vitamins are created equal. 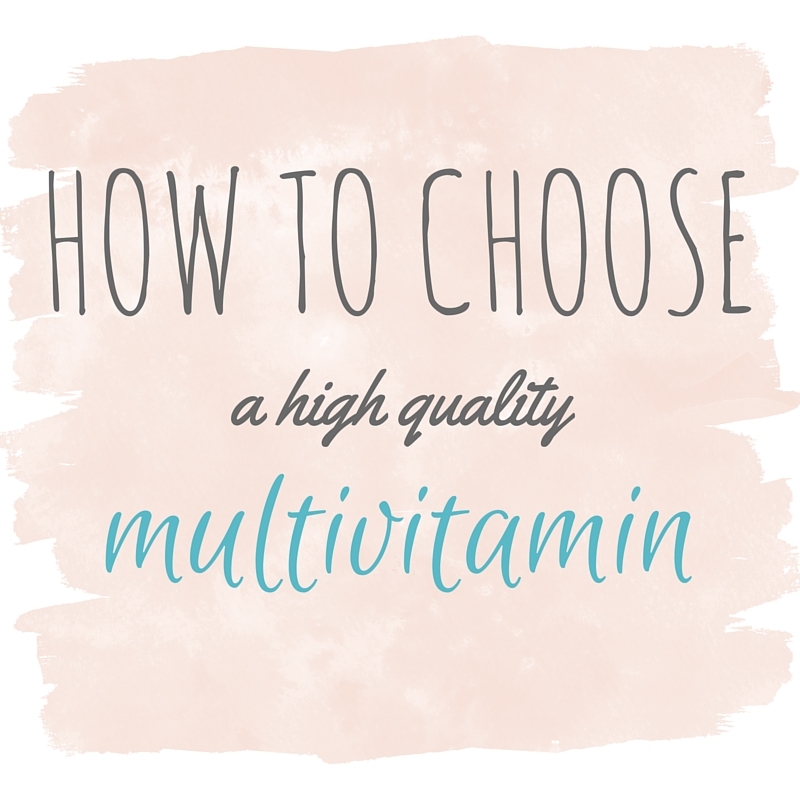 Some multivitamins, typically the cheaper options found at your local drug store, are poorly absorbed and chock full of fillers and additives you don’t need. It is 100% worth it to splurge on higher quality vitamins that your body can actually utilize to keep yourself nourished and feeling great. 1. Choose powdered capsules over compacted tablets. Generally speaking, powdered capsules are better absorbed than cheaply compacted tablets. The capsules are made by enclosing powdered vitamins in a casing made of cellulose fiber or gelatin that quickly dissolves in your intestines, allowing the powdered nutrients to disperse and be absorbed. If you struggle with swallowing vitamins, a huge perk of powdered capsules is their ability to be broken open! Yep, you can totally pop open your vitamin capsules and pour the powdered contents into a smoothie. The tablets are made by compressing the powdered vitamins until they form a compact tablet. This requires the use of binders to hold the tablet together, disintegrants to help it break apart in your GI tract, and shellac or corn coating to keep it all together. They may also contain fillers that some people are allergic or sensitive to, like lactose. Why consume these extra ingredients when you can get a purer form in a powdered capsule? The compacted tablets CAN be formulated to break apart quickly by including cellulose fillers that absorb water and help the tablet break apart, but these are not typically used in cheaper drugstore vitamins. 2. Don’t be turned off by serving sizes. Don’t be dismayed by the larger serving sizes on many high-quality multivitamins. It’s actually a good thing! Powdered capsules aren’t compacted to save space, so to get the appropriate dosage, you have to take a larger number of pills (typically 3-6 capsules per serving). Again, once the capsule dissolves and the powder is released, your body is able to efficiently absorb all those vitamins and minerals. Super-packing a serving of vitamins into one giant horse-pill just means that your body has to work harder to break the vitamin tablet apart and absorb the nutrients (unless you purchase very high-quality tablets that dissolve quickly, which you are unlikely to find at your local store). 3. Avoid potentially irritating or allergenic additives. 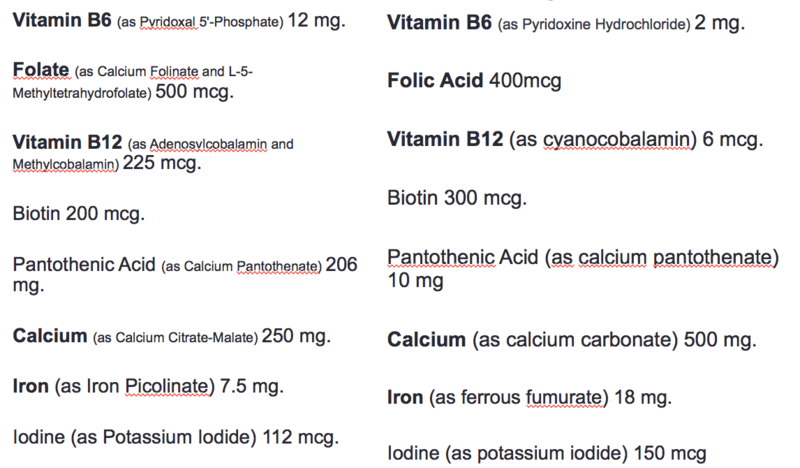 Watch out for any of these ingredients in your vitamins/supplements. They are cheap additives that really don’t need to be there! A milk sugar that can cause gas and bloating in people who are lactose intolerant (65% of adults). You only need to avoid lactose if you experience uncomfortable symptoms when you eat it. An emulsifier often used in soaps. Irritating to the skin & GI tract of many people. 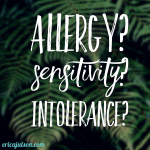 Some people, especially those with atopic diseases like allergies, asthma, or eczema, are sensitive to these artificial ingredients, causing inflammation in the body and an increase in atopic symptoms. A solvent used in vitamins that can cause tissue irritation when consumed. 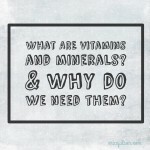 Vitamins and minerals come in many different forms, and some are better absorbed than others. Choose METHYLATED FOLATE rather than folic acid. Folate is the natural form found in foods, while folic acid is the synthetic form (made in a lab). Unfortunately, folic acid is the form of the vitamin widely used in food fortification and supplements. 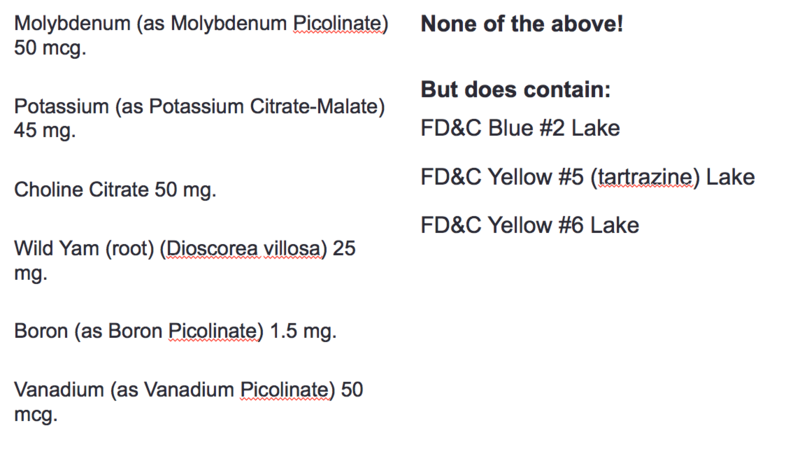 Whereas natural folate is converted into the usable form directly in the small intestine, folic acid has to travel to the liver first, and depending on the dosage and your body’s unique biochemistry, you may not be able to convert all that folic acid to the usable form fast enough. This leads to high levels of circulating folic acid in the blood stream, potentially increasing cancer risk. Similarly, methylated B12 is MUCH better absorbed than its cheaper/inferior/more common version, cyanocobalamin. Methylated B12 is the form our body can use right away, whereas cyanocobalamin must go through a few steps before it is usable. First, the cyanide molecule that is bound to the B-12 must be removed, neutralized, and excreted from the body, and a methyl group must be added for the B-12 to be ready to go. Why waste the time? And why take a compound that includes cyanide (even though the amount is VERY small and likely harmless), when you can take the methylated (and cyanide-free) form instead?? Look for Methylcobalamin on the label instead or Cyanocobalamin. 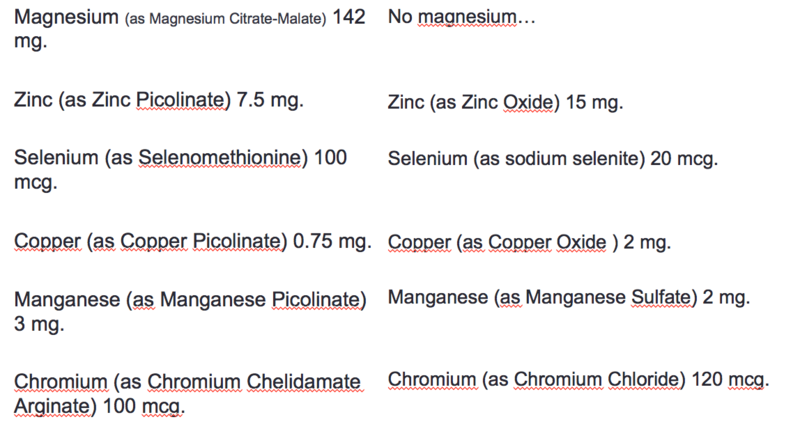 These are minerals attached to amino acids! These forms of minerals are more bioavailable than other forms. 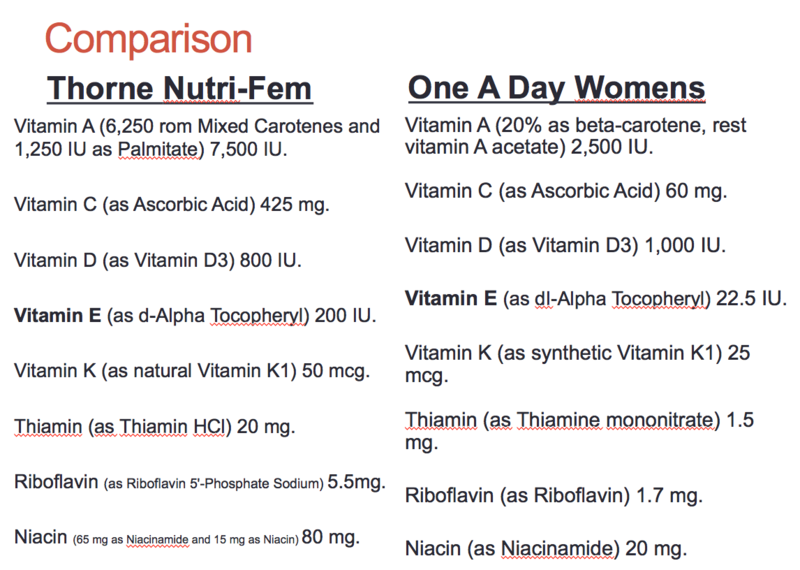 Here is a fabulous side-by-side comparison of one high-quality supplement from Thorne vs Women’s One-A-Day. **Thorne is my preferred brand of supplement. They are a pharmaceutical grade supplement that typically markets to medical professionals, rather than consumers, but they can be purchased directly from their website, or even on Amazon (but the quality is not guaranteed on Amazon). 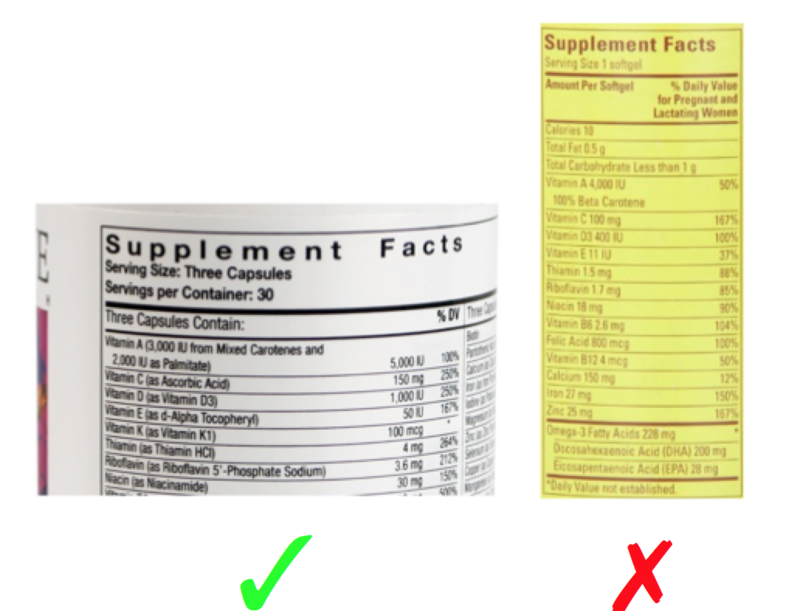 With this side by side comparison, it’s pretty obvious which multivitamin is best. The Thorne vitamins are more expensive, but they actually work! 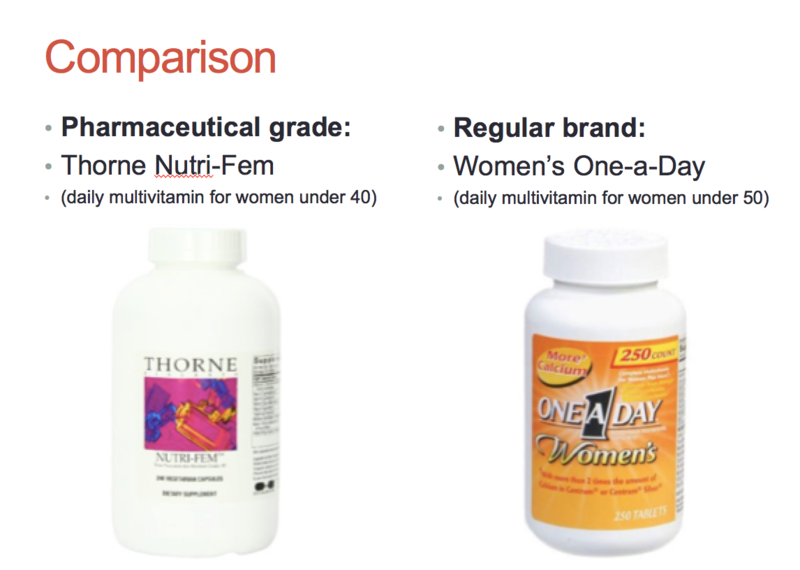 The one compared above is specifically for women over 40, and is ~$45 for 240 capsules (I recommend taking 4/day, so that is a 2-month supply). Totally worth it! 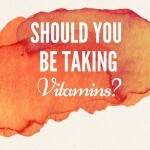 In general, look for “pharmaceutical grade” vitamins, rather than “food grade” options. Pharmaceutical grade supplement companies regularly test their products for quality and purity, and make sure there are no contaminants. Many of these companies also independently verify the source of their ingredients to make sure they are of the highest quality (this is also very important knowledge for people with food allergies and/or sensitivities!!). 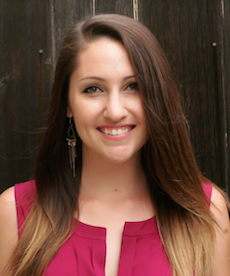 If you have specific questions about which vitamins/minerals/supplements are right for you, you can book a personal nutrition counseling session with me!